Most of us have grown up in a world of conveniences. There are appliances and gadgets in our homes to meet our every need. We do not have to worry about how to go to the bathroom, we have a nice toilet or two in our houses just for that purpose. We walk on cement sidewalks and eat in restaurants. Basically we do not have to worry about our impact on the land in the same way that we do when we are traveling or camping in the wilderness. Note: Minimum Impact Usage should also be apart of urban living and include: composting, garbage removal, recycling, transportation, etc. As we try to lessen our impact on the wilderness lands that we love, we find that life in the wilderness is an ever changing world. In the urban world we have one basic rule for going to the bathroom ... just find one and have a seat, but in a land without procelain, we find the skill set is ever changing. Skills? Yes, wilderness actions require skills from how to go to the bathroom in a rocky desert - to where to wash dishes in a rain forest - and all points in between. There are suggested procedures for most aspects of living in the wilderness and they change depending on the environment. To achieve minimum impact usage, we must have knowledge of the procedures and understand how they change for each environment. The action required for minimum impact usage must be tempered with knowledge and driven by a commitment to outdoor ethics. Knowledge is a quest. We are always learning. The knowledge needed to minimize impact is a fluid one. The required knowledge is ever changing. For the self learner - read books, magazines, and check out online sites, learn from others in your group, let your conscience be your guide - keep your eye on the goal of achieving minimum impact and try to do the right thing. For example - if you do not know how far from the creek you should go ... error on the side of going further away. For the group learner - participate in a class or seminar. Many classes are available from organizations, outdoor stores, and camps. Use knowledge as a base then add to the base with experience. Some classes even offer certificates. Just because someone else is doing it, doesn't make it right. For example, we have seen campers building fires almost next to a sign that say no fires - the correct procedure would be not to build a fire even if someone else is sitting by a roaring flame. Don't overlook the information on trailhead kiosks. Most popular trailheads have minimum impact usage information posted on the boards. The information is generally current and pertinent for that area. 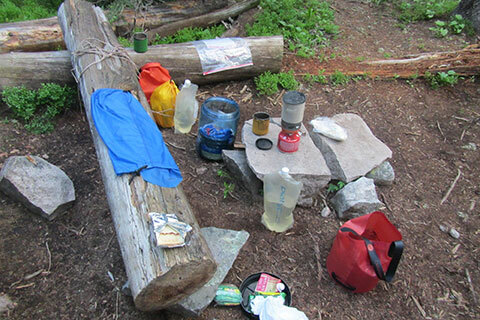 On the backs of many permits (even those that attach to your pack) are the backcountry rules. Ask the Rangers issuing the permits if you have any questions. Always follow the posted rules for a specific public land. If there is any doubt, error to the side of a strict interpretation of the rule. Weigh your choices. Pick the best solution. Knowledge gives the user a quiver of solutions. Just don't lose sight of the target.